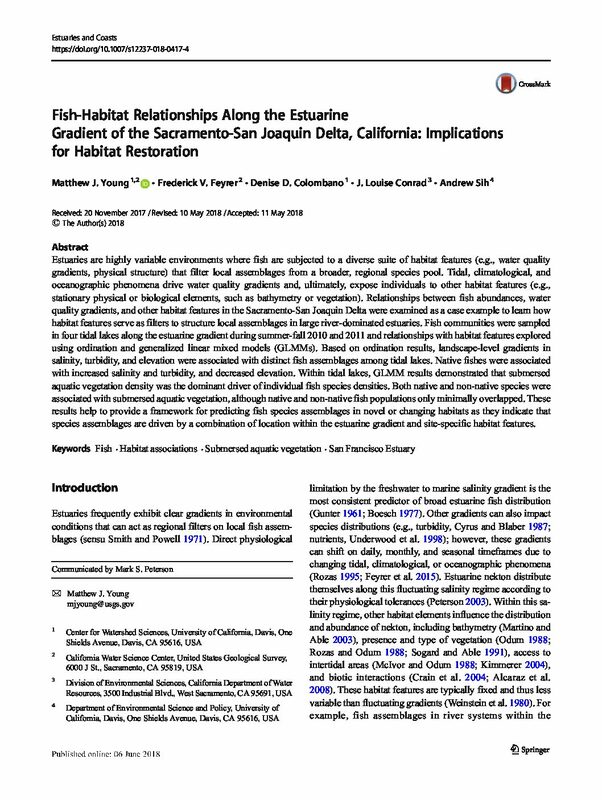 Estuaries are highly variable environments where fish are subjected to a diverse suite of habitat features (e.g., water quality gradients, physical structure) that filter local assemblages from a broader, regional species pool. Tidal, climatological, and oceanographic phenomena drive water quality gradients and, ultimately, expose individuals to other habitat features (e.g., stationary physical or biological elements, such as bathymetry or vegetation). 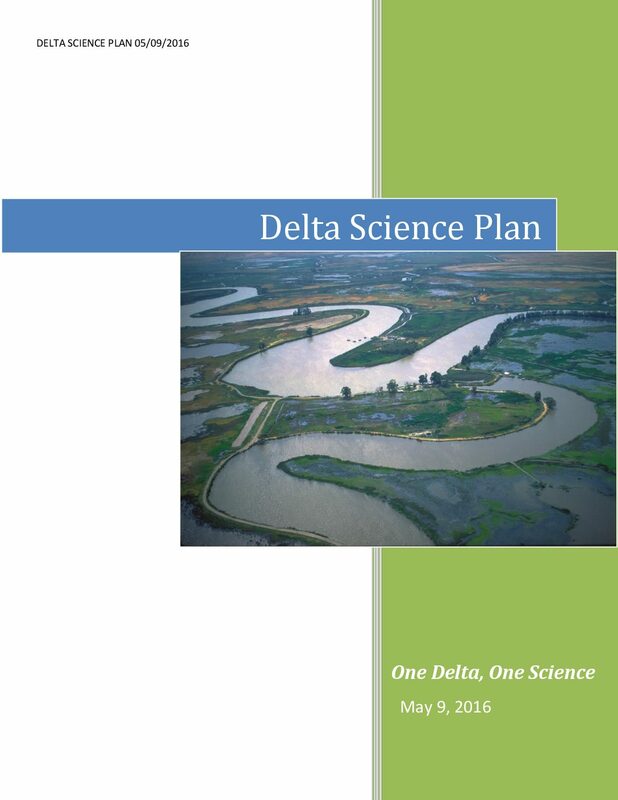 Relationships between fish abundances, water quality gradients, and other habitat features in the Sacramento-San Joaquin Delta were examined as a case example to learn how habitat features serve as filters to structure local assemblages in large river-dominated estuaries. 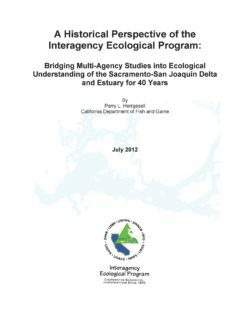 Fish communities were sampled in four tidal lakes along the estuarine gradient during summer-fall 2010 and 2011 and relationships with habitat features explored using ordination and generalized linear mixed models (GLMMs). Based on ordination results, landscape-level gradients in salinity, turbidity, and elevation were associated with distinct fish assemblages among tidal lakes. Native fishes were associated with increased salinity and turbidity, and decreased elevation. 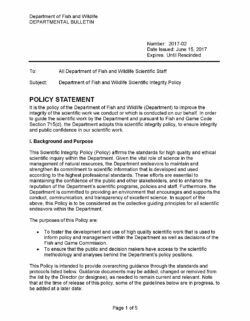 Within tidal lakes, GLMM results demonstrated that submersed aquatic vegetation density was the dominant driver of individual fish species densities. Both native and non-native species were associated with submersed aquatic vegetation, although native and non-native fish populations only minimally overlapped. These results help to provide a framework for predicting fish species assemblages in novel or changing habitats as they indicate that species assemblages are driven by a combination of location within the estuarine gradient and site-specific habitat features. 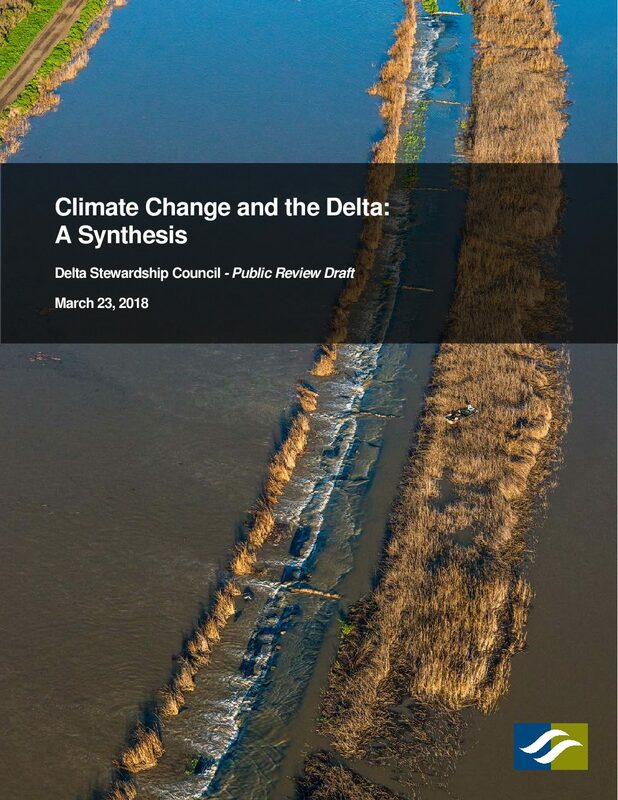 Section 229 of the Water Code directs that the California Department of Public Works, acting by and through the State Engineer, shall "investigate conditions of the quality of all the waters within the State, including saline waters, coastal and inland, as related to all sources of pollution of whatever nature and shall report thereon to the Legislature and to the appropriate regional water pollution control board annually, and may recommend any steps which might be taken to improve or protect the quality of such waters." 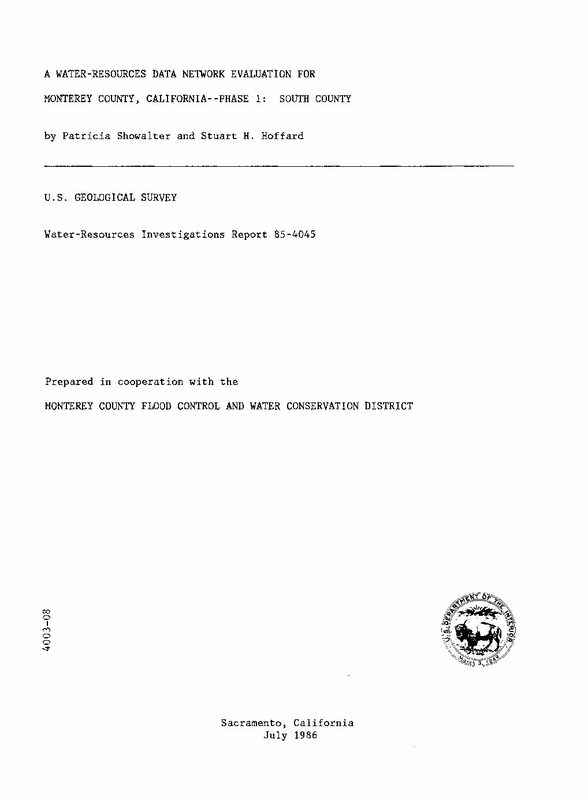 In order to carry out the intent of Section 228 of the Water Code with respect to investigations of quality of ground waters within the State, it has been necessary first to compile available geologic data in order to locale and define the approximate boundaries of the more important ground water basins. 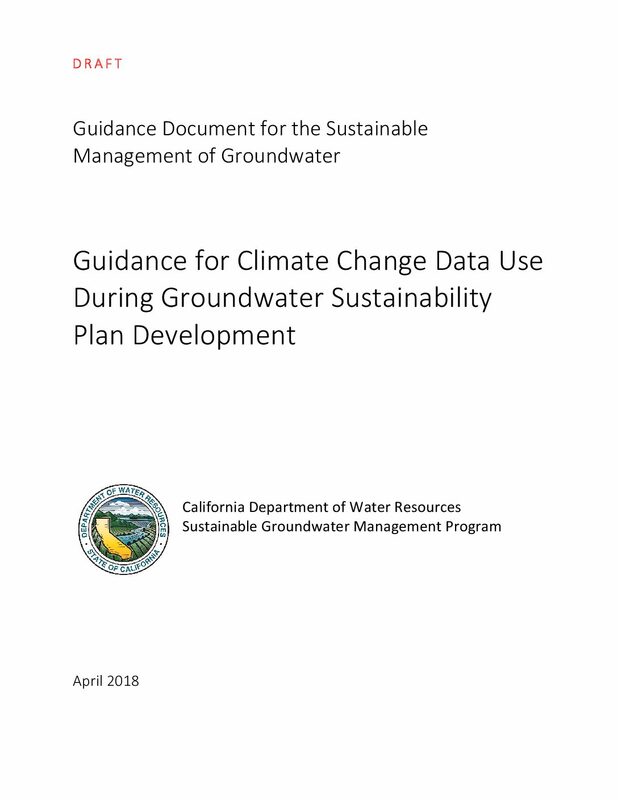 A base index map showing the principal areas of groundwater storage in the State of California has not been previously prepared. 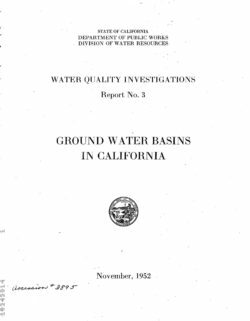 Such a map has been complied for this report in order to establish a uniform name and numbering system for groundwater basins, which can be expanded as new areas of ground water storage are identified, or as it is found necessary to divide the larger areas into subbasins. 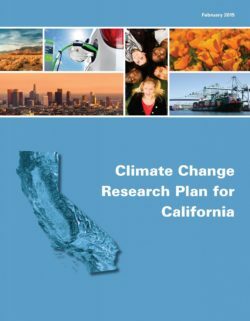 It will serve as a basis for the planning of future investigations of the groundwater resources of California. 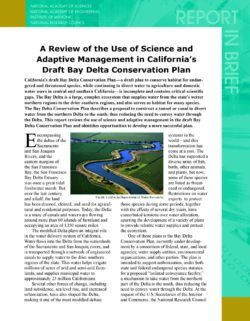 This report identifies alluvial or valley fill areas which contain the principal groundwater resources in California. However, the report is necessarily not complete because of lack of information for many areas of the state. In general, the areas of groundwater storage indentified include: (a) the major alluvium-filled areas of known groundwater storage and extraction; (b) the extensive areas of alluvial-fill in the Colorado, Mojave, and Basin and Range desert areas which may contain usable groundwater, though little is known of their storage capacity or recharge; and (c) some of the smaller alluvium-filled areas which may furnish a portion of local domestic, irrigation, municipal, and industrial water supplies.